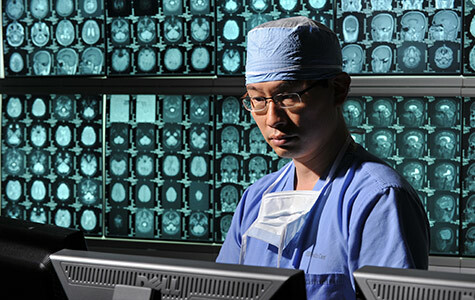 Neurosurgeon Albert Kim, MD, PhD, shown planning for surgery, leads a team that has identified a new vulnerability in brain tumor stem cells. Such cells are notorious for their ability to resist treatment and regrow tumors. The ability of many brain tumors to regenerate can be traced to cancer stem cells that evade treatment and spur the growth of new tumor cells. But some brain tumor stem cells may have an Achilles’ heel, scientists have found. The cancer stem cells’ remarkable abilities have to be maintained, and researchers at Washington University School of Medicine in St. Louis have identified a key player in that maintenance process. When the process is disrupted, they found, so is the spread of cancer. The findings are published online June 11 in Cell Reports. Kim studies glioblastoma, a deadly form of brain cancer that each year strikes about 18,000 people in the United States. The average length of survival after diagnosis is 15 months, and only 30 percent of patients survive more than two years. Scientists have realized in recent years that some cancer cells in glioblastomas and other tumors are more resistant to treatment than others. Those same, more defiant cells also are much better at re-establishing cancer after treatment. “These tumor stem cells are really the kingpins of cancers — the cells that direct and drive much of the harm done by tumors,” said Kim, who treats patients at Siteman Cancer Center at Barnes-Jewish Hospital and Washington University School of Medicine. Kim and his colleagues identified a protein, known as SOX2, that is active in brain tumor stem cells and in healthy stem cells in other parts of the body. The researchers found that the tumor stem cells’ ability to make SOX2 could be turned up or down via another protein, CDC20. Increasing SOX2 by boosting levels of CDC20 also increased a tumor’s ability to grow once transplanted into mice. Eliminating CDC20, meanwhile, left tumor stem cells unable to make SOX2, reducing the tumor stem cells’ ability to form tumors. “The rate of growth in some tumors lacking CDC20 dropped by 95 percent compared with tumors with more typical levels of CDC20,” Kim said. When the scientists analyzed human tumor samples, they found that a subset of patients with glioblastomas that had the highest CDC20 levels also had the shortest periods of survival after diagnosis. Kim’s lab is exploring methods to block CDC20 in brain tumors, including RNA interference, an approach in which the production of specific proteins is blocked. That general approach is in clinical trials as a therapy for other cancers, viral infections and other illnesses. This research was supported by the National Institutes of Health (NIH), grants K08NS08110, K01AG033724 and P50CA094056; the American Cancer Society; Voices Against Brain Cancer; the Elsa U. Pardee Foundation; the Concern Foundation; and the Duesenberg Research Fund. Mao DD, Gujar AD, Mahlokozera T, Chen I, Pan Y, Luo J, Brost T, Thompson EA, Turski A, Leuthardt EC, Dunn GP, Chicoine MR, Rich KM, Dowling JL, Zipfel GJ, Dacey RG, Achilefu S, Tran DD, Yano H, Kim AH. A CDC20-APC/SOX@ signaling axis regulates human glioblastoma stem-like cells. Cell Reports, online June 11, 2015.